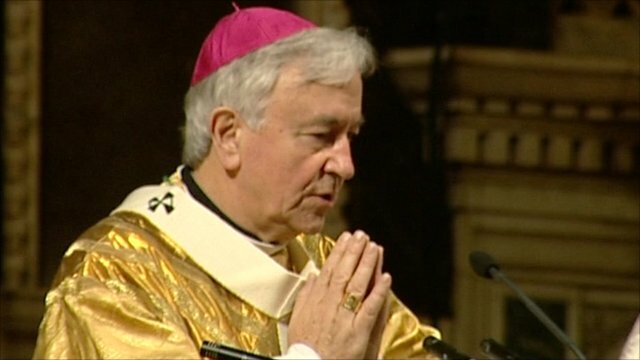 It is a sad comment on the leadership of the Roman Catholic Church in England and Wales that the Archbishop of Westminster, Vincent Nichols, thought his Christmas sermon a suitable place to launch his fiercest attack so far on the Government's plans to legalise gay marriage. It might have been hoped that, at a time of joyful festivities, a time moreover when people of all religions and none are uniquely open to the Christian message, the prevailing tone from the pulpit would be one of generosity. Instead, Archbishop Nichols turned his attention to the politicians, decrying the fact that "there was no announcement in any party manifesto, no Green Paper, no statement in the Queen's Speech". "From a democratic point of view," he told his flock, "it's a shambles". No more of a shambles, it might be said, than the Archbishop's Christmas message. His words might have given the impression that the Government would require the Roman Catholic Church to marry homosexual couples. But nothing is further from the truth. Indeed, one disappointing, even shameful, aspect of the proposed law is that the Church of England, the established Church, will be banned from conducting gay marriages, even though – as we report today – opinion is strongly in favour of letting individual priests do so if they wish. And if the Church of England will not be permitted to conduct gay marriages, at least for the time being, it is unthinkable that any pressure would be placed on the Catholic Church, whose hierarchy is far more united in its opposition than that of the Anglican Church. The proposed legislation is designed to give gay people, not before time, full equality before the law. So what is the Archbishop so worried about? If it is that some Roman Catholics might draw encouragement from ministers' plans, then there is a doctrinal argument to be had within the Church. But it is no reason for the Archbishop to attack a piece of proposed state legislation in his Christmas sermon. That he chose to do so suggests weakness, not strength.